I've been sent some truly wonderful pictures from the fans of Derek. So many of you have taken the time to be creative and you're all brilliant - I can't thank you enough! I've tried to include them all on the website, but I'm being inundated - but I'll keep uploading them so keep them coming! But I have to do a separate piece on the artwork I received from Rich Nairn (@richnairn). I've included it in the top banner, on Facebook and also on Twitter because not only has he taken the time to create a masterpiece, including Derek, Dougie, Hannah and Kev, he has also included a little 'Tadpole Hitler' in a fish tank! He's also kindly let me use it on the site. I would never take such a creative without giving credit where credit is due. 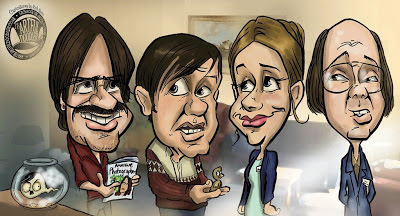 Rich is the owner of www.theartfuldoodler.co.uk and is a very talented cartoonist and caricaturist. Just look at the work on the website - truly fantastic stuff! Thank you Rich - it is very appreciated.